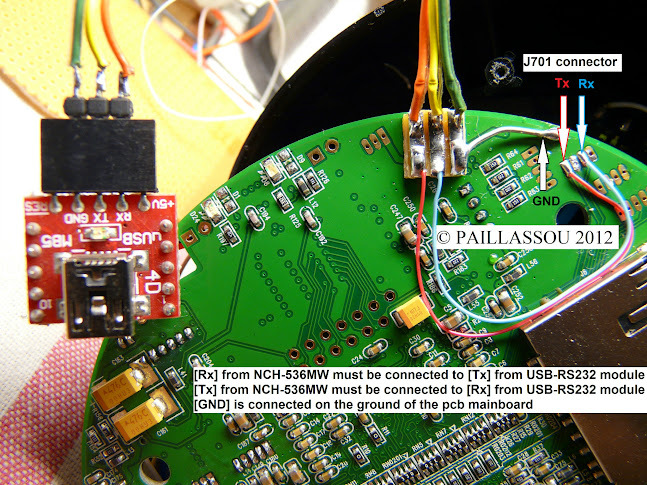 •How to dump the existing firmware file (in the flash memory) through RS232 ? •How to dump "boot" / "rootfs" / "setting" ? •is it possible to create "boot" / "rootfs" / "setting" files with the original firmware (firmware.pkg) ? •How to upgrade the firmware file through RS232 ? •How to flash the firmware file through RS232 ? i'm able to enter in the bootloader of the mainboard, but after, i don't know how re-flash the firmware ? Hisilicon PCI work at slave mode. delayed to setup 512 skb queue items. mt9v131 driver init fail for device init error! Set system time as date 06161427112.01. /dev/mmc/blk0:/var/log/accesslog.txt not exist,then will creat this file! New SD card insert. start fsck anyway. hi3511_base: module license 'Proprietary' taints kernel. http Live svr Init ok.
RTSP Live svr Init ok.
rtsp_o_http Live svr Init ok. MOBILE Live svr Init ok.
<THTTPD> wait for any child end. is it possible to decompile the firmware B12SE_V1.4.0.1.5_536mP2En.pkg file ? is it possible to retreive the boot / rootfs / setting files and webui in the firmware B12SE_V1.4.0.1.5_536mP2En.pkg file ? If you have rs232 access, just dump off the MTD device. Then copy to the SD card and off.. In those pkg files is only the root filesystem. The kernel doesn't get updated, it seems. You can cut the first 144 bytes from the pkg file to get the JFFS2 file. That can be flashed to the camera. Without length specified, it will DOWNLOAD the filename from the TFTP server and flash that to the location. If you specify a length, it will UPLOAD the flash contents from the specified address up until length to the TFTP. This will push it right onto your TFTP server in no time. And now the important part: Never forget to erase the area before you're flashing new data to it. Reason is that flashing only changes bits to 0. If they are already 0, they're left alone even though the firmware file might have a 1 at that location. I tried to flash a new JFFS2 (tftp 0x34200000 root.jffs2) without erasing the area first (erase 0x34200000 +0xd00000) and got hundreds of error messages about a corrupted JFFS2 file system. After erasing the area and flashing again, everything was fine.